This one actually took longer to put together than both of the previous versions and I am still not 100% pleased with how it turned out. Lighting it hard. This was to be my first scene rendered using the new version of Vue d'Esprit (Vue 2014) but a few showstopping bugs sent me back to my "trusty" Vue 11. The darkness in this one makes it look a lot better than the gallery version. It also feels more wintery and looks all pretty and stuff. I love the darkness of this one. Really beautiful. I haven't visited the site in quite some time (old lifetime member) and I have to say your work in 2013 and 2012 has been magnificent. Some truly beautiful piece of art. I remember a few years ago I posted some comments about certain aspects of previous favourites that lacked some photorealism which ruined the illusion of an alternate reality. You've obviously taken that to a completely different level now. Would LOVE to see a blue render of the lights!! That would be awesome! I'm not of the opinion that I should comment much on how it looks or how to "improve it" - an artists work is his work, after all and you would definitely have your own opinion on "whats best". While i like the image as a whole, the mini ocean on the sidewalk effect is a little eye jarring, sidewalks dont have waves on them.... puddles sure, but even during hurricanes the wind doesn't drive the water into peaks like what is portrayed under the path. Mostly, I like it. I like the colors... the mood. I dislike the distracting blurry water droplets on-the-lens effect, though it makes it a bit more "realistic". Will there be a version in the pickle jar without the drops-on-the-lens? 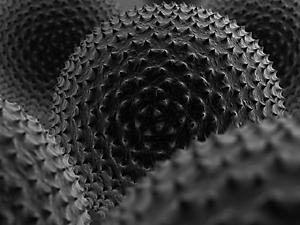 My only other comment would be to make the deep background more interesting than "grey". I like the snow on the background trees and the brighter/oranger lights in this one, but I still prefer the first version. The crispness brings to mind a frigged cold night scene. 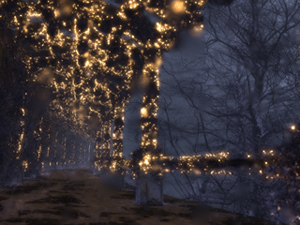 When I downloaded the dual screen I could see it was falling snow - and I suppose the foggy effect brightens things up. Still not my favorite, but not every piece is for everyone. Well, even if I have a LTaccount and can't afford a tip, I still really like your work! Especially in this case: How did you manage to get the "camera smudges" out of the picture ...? Nice 1! Looks great. Triple 5:4 upload is incomplete, though. Great work on v3 -- love it! It doesn't take my breath away the way that the fall version did -- mostly because of it being a night scene and lacking the color and richness of the other render. But it's still a fantastic piece in its own right. I like the snow on the tree and and the faint light reflecting off the falling snow -- they're great touches that add a lot of feeling to this. "The Shaded Path (Winter/Night) (2013)"
Oh yeah baby! Love this version. Can't wait for multi-screen! The 3rd Version is the winner.... the blurry foreground and the focus background along with all the tweaks makes this one my favorite so far!! My third render is up this morning. Minor tweaks to the snow on the tree branches (noise along the snowline) and removed the blurred snowflakes that muddied v.2. 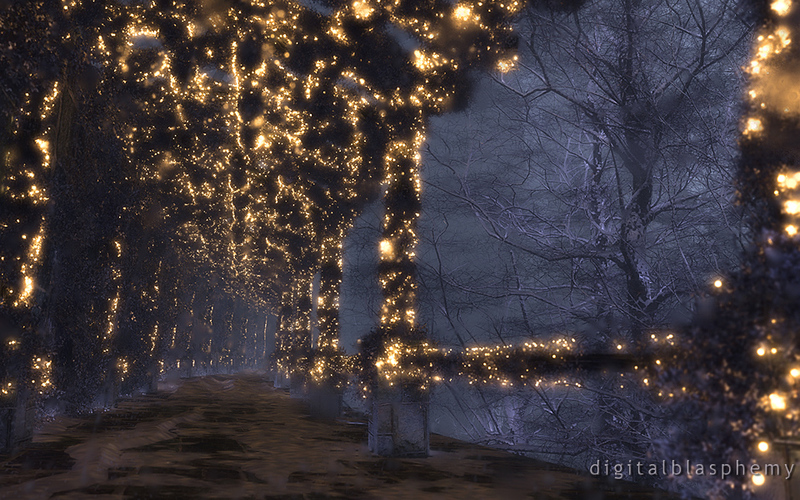 I am not crazy about how the particle snow rendered in this new version either. I hope to have a final version shortly that addresses this. I wear glasses so smudges like that annoy me and make me want to wipe some glass down. Yea, it's how I'd see it, but why would anyone want to wander around like that. Can you do a pick jar version with no smudges? The new version i like a bit less. The smudges look overdone. Especially considering there is no visible snow falling. Love the water-on-the-lens effect, and it's less "midnight-y". well done. Really love this scene. I don't think anything needs to be changed. No lights on the trees. I like how you can clearly see the branches and they are farther away, giving nice perspective. Fir tree's although extra work would be nice to see and a little bit more color. Nice though as is. I love it. How about adding some lights to the trees as well? Maybe blue lights. Love it. Really suitable for the bleakly cold winter, the kind of cold that leaches all the color out of everything. Brings back all sorts of memories. I like it. It would be cool to do a colored light one, or two. Maybe show some snowfall? It would be really cool if they did a Playstation one that had flurries! Keep up the good work, Ryan! Happy Holidays! Let it snow, let it snow, let it snow! This is a great wallpaper! Though the snow was a bit low graphic. But that doesn't stop me from putting the 10 up top! Oh and I really didn't care how the lights weren't colorful, that would give it a Christmas feel and take away the winter night feel. I am probably alone in this, but I actually like the white lights. It does look cold, which has very much been the weather this year. Falling snow would make it feel a bit better and would make the blurs really seem like melted snow on the lens; although if the blurs get fixed and we saw just the falling snow I'd like that too. The trees need lights. Blue version please! Great start though. The snow on the camera lens is awesome... Makes it real. The smudge thing you are talking about.... looks like melting ice on the camera "lens" so to speak. I thought it was intentional. You mean its something Vue does on its own? Agree with all that it's missing something. The foundation is amazing and no doubt it will become a favorite. Don't think colored lights are the answer. It currently has an eerie feel which actually is more profound than a holly jolly one. This is a really nice piece. I might suggest putting some contrasting elements in the scene, glowing bells or ghostly holly wreaths or other decorations. I really love this one. Love the lights, and love the way you've done the path: lovely combination of the path's pattern showing through the snow drifts. I agree colored lights would make it more festive, but I like the clean white light, too. Perhaps some falling snow in front of the bare trees to the right would make that part of the image more visually interesting? 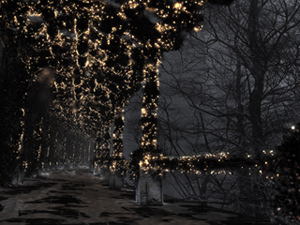 I think it looks cold, which naturally it would as its Winter but... could you make it do that the lights let off more of a "glow" so that it illuminates the path and possibly even bounces off the trees a little too? I like it - it has a very peaceful, quiet feel - and very cold. Colors would give it more of a playful feel - but don't know if it would work given the open air to the obviously really cold forest night. Note: in the center between the 2nd and 3rd pillar in there is a round circle smudge thing that looks really weird. Love this can we get colored lights?